Cane toads were introduced to Australia as a means of controlling pest beetles in the sugar cane industry in 1935. Since then they have been spreading throughout northern Australia and are moving westward at about 40-60km per year. 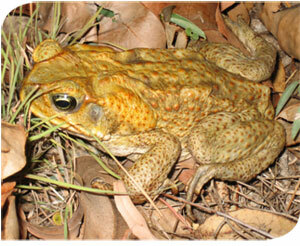 Cane toads can produce large numbers of offspring and are colonising northern Australia at an increasingly rapid pace. Cane toads are capable of eating around 200 insects a night. Uncontrolled numbers of cane toads increases food competition and have been contributing to a significant loss of smaller native species. Distribution of cane toads has spread into WA and the possible future habitat of cane toads could one day extend to Geraldton. We have been supporting community involvement in controlling cane toad population numbers for many years. Employing cane toad detector dogs is a token gesture and a waste of taxpayer’s money. The Greens rather see the government be putting generous amounts of funding into achieving cane toad eradication in Australia once and for all: through boosting investigations into biological controls and continuing to fund the community group Kimberley Toadbusters, whose efforts during the past decade has resulted in a significant slowing of the cane toad front.